The paramedic primarily provides pre-hospital emergency care to acutely ill or injured patients. 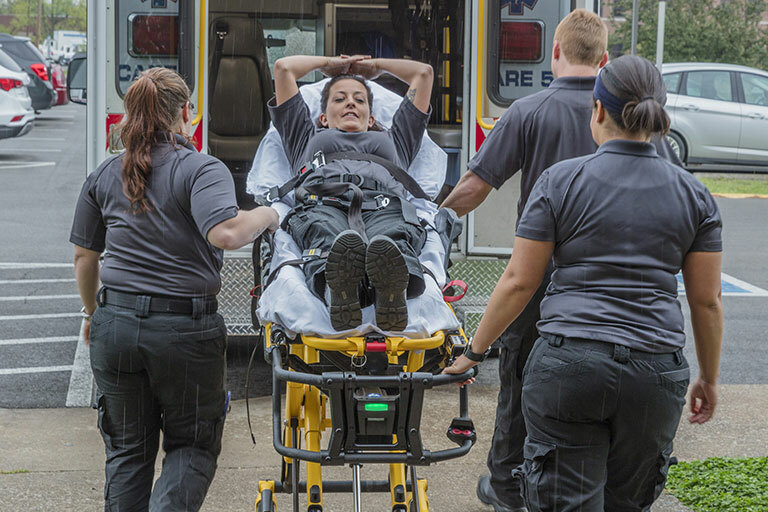 This care is delivered in a variety of environments including: ambulance, mobile advanced life support units, industrial on-site units, fire departments, and other sites. The curriculum is designed to provide the student with the didactic knowledge and clinical skills to deliver emergency care. This program prepares individuals for positions in agencies and institutions that provide emergency response services. Applicants with an ACT composite score of 21 or above; or comparable Compass scores according to KCTCS. Applicants who have a cumulative GPA of 2.5 or better (4.0 point scale) in 10 hours of college credit applicable to the paramedic program. Applicants who have completed the biological sciences (BIO-137 & BIO-139 or BIO 135) and medical terminology (AHS 115)) courses listed in the paramedic curriculum with a grade of "C" or better and Math 110 or better with a grade of C or better or a Dosage Calculations Course. Applicants accumulating the highest possible pre-admission points will be accepted into the program. It is the responsibility of the applicant to ensure that all application material (i.e., college & program related material) is on file by days after pre-admission conference (date will be in student bulletin).